President Mahinda Rajapaksa addressed the newly elected parliamentarians from the ruling party UPFA at the Presidential Secretariat on 18th April and said that in the future journey of the motherland pledged by the “ƒ”¹…”Mahinda Chinthana Idiri Dekma- A Brighter Future’ their only aim should be the development of the country. He further stated “Sri Lankan people did their duty by the country now the time has come for them to repay that duty by the people”. 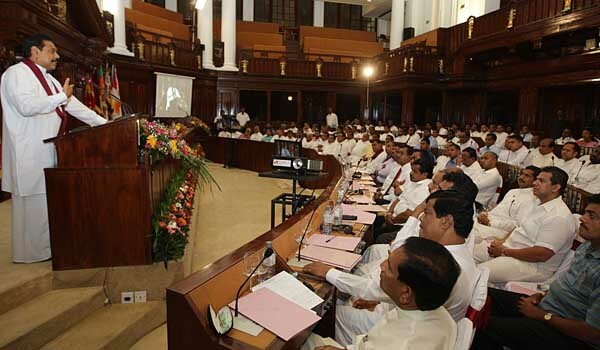 President Rajapaksa made these comments at the special workshop which was held at the Presidential Secretariat for the UPFA MPs to orient them on parliamentary traditions, standing orders as well as on the records of former parliamentarians. President Rajapaksa cut a cake and celebrated the occasion with the new MPs. The ruling coalition has so far received 117 slots in the 225-member parliament and another 26 seats are expected after the re-poll on April 20th in 37 divisions in Nawalapitiya electorate in Kandy District and Kumburupitiya polling division in Trincomalee District. The results from those polling centers were annulled by the Election Commissioner due to the election malpractices occurred at the April 8th General Election. Meanwhile, the Seventh Parliament is scheduled to meet on Thursday, April 22nd of this month. The Parliamentary meeting is scheduled to begin at 8.45 am and the Parliamentary Secretary General has intimated to all elected members that their presence with the Complex by 8.30am is important. They have been informed of the proceedings on the opening session of the new parliament.